Newly-promoted League One side Southend United are interested in signing striker Craig Mackail-Smith. 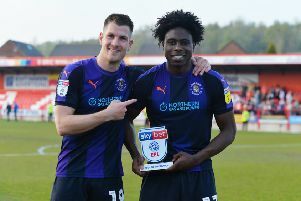 The 31-year-old forward has been training with Luton during pre-season, travelling to the training camp in Portugal, and featuring in the pre-season games against Boreham Wood and Hitchin Town. However, no deal has been done yet, and other clubs have been linked Mackail-Smith’s services with the Shrimpers first to show their hand, as speaking to Southend paper, the Echo, boss Phil Brown said: “I’ve made contact with Craig Mackail-Smith and he is certainly someone I’m interested in. “He’s at Luton on a fitness exercise and I would like to take a look at him if possible.